As I was driving down from the work site the other day, I noticed a bird standing on the side of the road, near the creek (“crick” in local vernacular.) I stopped, rolled down my window, and spoke to it. The bird stared at me. “It’s pretty smoky today, isn’t it?” I remarked, referring to the smoke from our local wild fires. “Do you live around here?” I asked. The bird stared at me, pooped, and then stuck its feathers up in this fashion. Ruffed grouse. Image by Gerry and shared under Creative Commons 2.0. Turns out that I had stumbled across the not-entirely-elusive ruffed grouse of local lore, and the namesake of our local creek. 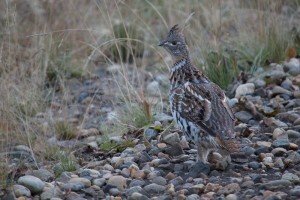 I had not realized that there are still actually grouse living out here. 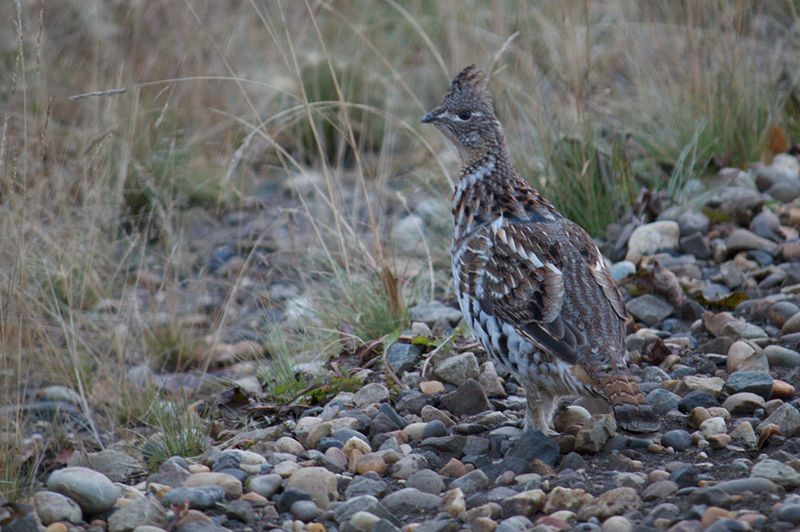 Grouse are often confused with partridges, and apparently are also called prairie chickens or thunder chickens. To be exact, though, those names both refer exclusively to completely different birds entirely. A grouse, ruffed or not, is simply a grouse. Whatever they’re called, grouse aren’t terribly talkative. I stared at it, and it stared at me. “That’s a neat feather trick,” I said. The bird stared at me, and pooped again. And, chagrined, I drove back home. LOL!!!!!! My poor child, you have developed (quite well for one as young as you are), the Laing-Jones “talk to anything that moves gene!” Not a bad gene really, but with Grandparents both on the talkative side (one to the max) I don’t see how you could avoid it. Get ready to talk to birds, dogs, cats, bugs, worms, and sometimes even stuffed animals. The later stages the animate and inanimate are both spoken to, and for some reason, in your mind they answer you back. See your Father for more on this, he suffers silently, but he does suffer. I have no advice for you, as you get older people will know that they can stop you on the street and you will give your views on the world, the town, the people, and how much lint you retrieved from your navel this morning for a full hour and a half WITHOUT TAKING A BREATH!!!! Amazing isn’t it? You will start flicking your eyes “Do I know that person, can I speak?” at the end, it won’t matter if you know them or not, you’ll just corner them and let loose. Best of luck, and I mean that……I’ll warn as many people as I know!